22 Jan Becky Till: Skier! Becky Till began skiing with her family 16 years ago. She was a vibrant, spunky child, always ready for adventure, and the more exciting the adventure, the better. I called her my ‘Adrenaline Junkie’ because it just seemed she was hooked on that adrenaline high from risky activities. Risk was a major issue, as Becky needed significant support to ensure she was as safe as could be during these adventures, as her underlying complex disabilities and challenging health brought ever greater fragility into her world. Becky had been refused opportunities at two skiing programs that were operating for kids with disabilities, both basing their decisions on assumptions that she was ‘too disabled to benefit’. When asked for clarification on this statement, I was told that since she wouldn’t be able to eventually hold picks, or short poles to enable her to control her sled or Biski herself, and thus be independent in skiing, she therefore was unable to benefit from the program. There was no acknowledgement that there might be benefits of other kinds if Becky were supported through either of these programs, such as the thrill of skiing itself, communicative interaction directing her choices of slopes and speeds, social interaction and inclusion with other kids or with her family, who ALWAYS skied with her, pride in accomplishment, a sense of being an equal, welcomed and valued member of her skiing family and her ski club, etc, etc. Not to mention the benefits of plain fresh air. And somewhat ironically, at that same time, with her family, and with skiing friends, Becky was already skiing the slopes, without a sled or Biski, but in fact on her own two feet, in regular ski boots (albeit rear-entry) and on regular skis! The only adaptation used was a strap at her ski tips to keep them from crossing, and some assistance for her balance from an adult skier. She was thrilled with skiing! Always wanted to go, and was able to withstand cold temperatures without complication, as long as I had her adequately bundled. As a family, we joined The Heights Ski Club in 1995. Shortly thereafter, John Atkinson, who ran the CADS program at Mt St Louis moved his group to The Heights, where the reception was warm and welcoming, and which continues to this day. Little did John know that Becky was right there waiting to challenge him. And challenge him she did, for he had not worked with someone with her extent of challenges previously. Not only did Becky have significant quadriplegic Cerebral Palsy, but she had a tracheostomy to help her breathe, she required intravenous nutrition via a pump and a permanent intravenous line in her body and almost continuous infusions of that nutrition as well as intravenous medications. She had four other tubes in her body, supporting her medical intervention needs, and pumps, tubing, infusion solutions, and tubes tucked into her ski suit in order to be safely protected during her runs, while her trach was protected from the direct cold on a constant basis. 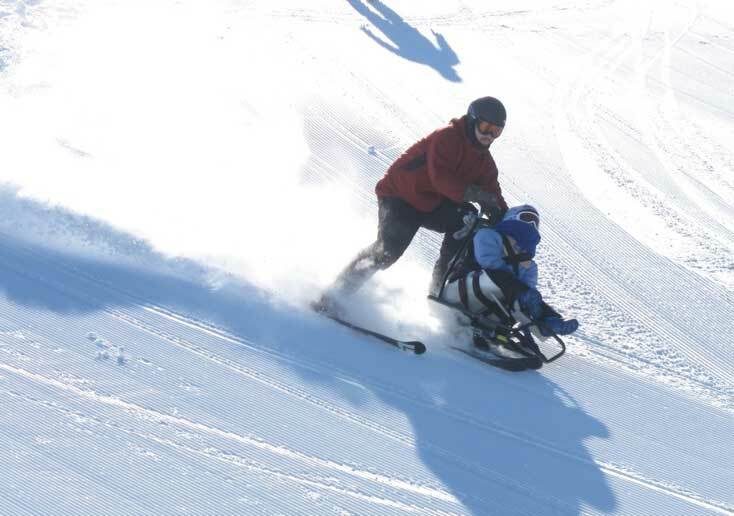 CADS didn’t have access to a standing skiing frame at that time, which would have enabled Becky to continue using her standing skiing skills, so she began using a modified Biski. This Biski was meant for people who primarily had lower body disabilities, but retained upper body skills. Becky needed support up to and including her head. So old wheelchair parts, headrests, special straps, cushions, and a neck brace were all incorporated into fashioning a functional Biski she could use. But John never wavered in welcoming her to skiing with CADS. The Heights never wavered in welcoming CADS to their ski club. Becky’s family never wavered in their determination to ski with her at all times. And Becky never wavered in her determination to ski! She formed strong bonds during her skiing activities, most notably with those who chose to be her skiing supporters. Amongst these were family friends and club members Roy and Christine Chidgey. They began skiing with Becky when she could ski standing, and everyone had so much fun, we decided to enter Becky into the Club Races at the end of the ski season. Since there was no disabled category, Becky simply entered the regular young women’s category. It should be noted that Roy has been known to repeatedly utter the phrase “Speed is our Friend!”, so it may be clear why he and Becky were ski buddies! In fact, despite the fact that Becky had several people available to be her helpers all season long, no one other that Roy would do for Race Day! In their first run down the double black, slalom race course, they took a tumble, scaring the ski patrol members out of their minds, but we had prepared for such eventualities…..like every other skier……you must get right back up and carry on, which is what they did, Becky laughing all the way! The second race proved them both, and Becky won her division, earning her a coveted gold medal and her name on the Club trophy. This was a feat she would repeat 5 times, in her ski career, only once placing second. She was SO proud of that trophy! The people who thought she wouldn’t be able to benefit from skiing just truly need to eat their words. Becky also established connections with her volunteers with CADS, starting with John Atkinson, and continuing through the years with several other daring and compassionate men and women. Her most recent supporters, Steve McDonald and Mike Davenport were able to assist Becky in her brand new Biski, the first one known in Canada that is designed for a skier with a full quadriplegia and needing full body support and a recline position. Becky used her new BiSki with Steve and Mike through the 2017 ski season, and it was the first time she was so beautifully and correctly supported. With its 4 point restraint system and sleek, deeply cushioned seat design, it looked like a racing device and was perfect for her physical needs and skiing dreams! Although Becky was unable to speak, she did have communication skills, and she had a very effective way of letting her supporters know if they had met her expectations during her runs. She would ‘EyeGaze’ at the runs she wanted to do, then give them her specialized, personal reward if they had met her expectations…..ie: if they had skied fast enough! She would beam a gorgeous smile at them, and make everyone feel like they had won the lottery! It was abundantly clear that Becky loved to ski, and she let the whole ski club know it too! Becky’s medical challenges kept her from skiing many times, to the dismay of all, and those medical complexities took a significant turn at Christmas this year. Becky gently took her last breaths in Sunnybrook Health Centre, surrounded by loving family and friends, in the early morning of Jan 8/18. Becky lived joyously, loved intensely, and left a mark in this world in multiple ways. She will live on in the hearts and minds of those she touched throughout her life, and she has influenced skiing for all people, both those with and those without significant disabilities Nationwide. Because of her deep love of skiing, Memorial donations in her name can be made to CADS, and if desired can be directed the The Heights division (please send an accompanying email to CADS Ontario President Gwen Binsfeld at president@cadsontario.ca to help ensure the funds are received where directed).